Visitors to London today will find it hard to believe that air pollution was once so bad that the atmosphere was technically classed as a solid. Those residents old enough to recall the dark days before the passing of the 1956 Clean Air Act often talk with geriatric fondness about stumbling around in the dark, blindly following the coughing and spluttering of friends and relatives as they sightlessly led them into traffic, off bridges and under buses. Those days are gone now and, all things being equal, it's probably a good thing that people going about their business in the capital can, you know, breathe and see and stuff. But what most people don't realise is that this piece of landmark anti-pollution legislation had its casualties - the Smog Dogs. With a keen sense of smell, faultless vision and an unerring sense of direction, the Smog Dogs were a specially trained breed of Labrador that could lead their owners safely through the swirling fumes. They also had a big red flashing light on their heads, which came in kind of handy. What no one realised at the time was that the animals didn't merely cope well with the fumes, they thrived on them. So much so that once the air cleared and the birds stopped falling out of the sky, the dogs found that they simply couldn't adjust. Imagine the chaos, thousands of working Smog Dogs suddenly unemployed. Desperate, destitute and practically choking on clean air, they wandered the streets surviving only on a combination of car exhausts, passive smoking and the occasional burning skip. Clearly this was a problem and so the British Government did what it always does when faced with a dilemma: it ignored it in the hope that it would go away. 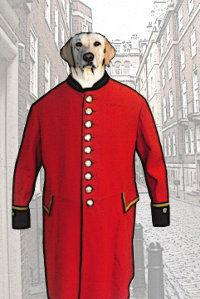 It didn't, and so in 1966 it founded the Royal Chelsea Smog Dogs Home, which was opened in a grand ceremony presided over by Lulu and Adam Faith. Here they could live out the rest of their lives in comfort, hacking and retching for all they were worth - the dogs, that is, not Lulu and Adam Faith... Although Lulu did have a room there that she used at the weekends and it was rumoured that Helen Shapiro rented a small kennel for six months in 1969. The Royal Chelsea Smog Dogs Home still stands today, as indeed do some of the dogs. You're most likely to see them at a special service on Maundy Thursday in which they stand to attention while the Queen pats them on the head and gives them a biscuit. It's an enchanting custom, but there is now talk of it being discontinued due to the extremely advanced age of the few remaining dogs, and the fact that last year one of them was sick on Prince Phillip's shoes. French polisher arrested for interfering with table. David Attenburger's Wonderful World of Nature. The credit card you can use in the afterlife. Fun for nearly all the family!